Would You Like A FREE Monthly Stock Pick? Prudent Biotech Model Portfolio Grows from $10,000 to nearly $4 million! The Portfolio holds 8 stocks at a time. Any changes to the portfolio (new buys/sells) are made only once per month, usually during the first trading week of the month. The portfolio is rotated at that time with new additions receiving equal amount from proceeds. The Portfolio is either fully invested in Biotech Stocks or in Cash / ETF holding short-term bonds when the market risk is perceived to be very high. Drawdown is an indicator of the risk of a portfolio based on a certain strategy. It measures the largest drop from peak to bottom in the value of a portfolio before a new peak is achieved. The Sharpe Ratio is the most widely used risk-adjusted return measure. It is calculated by subtracting the risk-free rate (typically US Treasury issues like the 13-week Treasury Bill rate) from the rate of return for a portfolio and dividing the result by the standard deviation of the portfolio returns. Developed by Nobel laureate William Sharpe, the Sharpe ratio reveals whether a portfolio's return over the risk-free rate, called the excess return or Alpha, is due to smart investment decisions or a result of assuming excess risk. This ratio allows for a quick performance comparison between funds and strategies. The higher a portfolio's Sharpe ratio, the better its risk-adjusted performance compared to a portfolio with a lower Sharpe ratio. Commissions, fees, taxes, etc. have been ignored in the above computations. In addition, returns from treasuries or money market funds accrued when the portfolio is partially or fully in cash are added to the total calculation. No leverage or margin is ever used in any of our model portfolios. The performance numbers are deemed to be hypothetical because they are based on unaduited backtesting and NO trades were actually executed in a brokerage account. 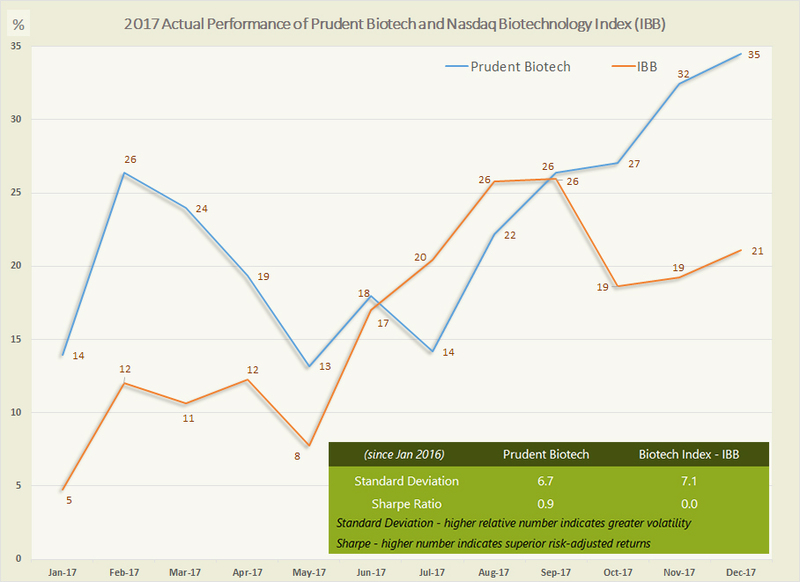 The backtested performance of Prudent Biotech Portfolio is from 2003 till end of 2015. Thereafter, since January 2016, the newsletter was published for subscribers and its actual performance is used to continue calculating the cumulative performance. The performance is unaudited and presented for illustrative purposes only. No representation is being made that a subscriber will or is likely to achieve profits or losses similar to those shown. Past performance is not indicative of future results, which may vary. Historical performance for all periods can vary when we Revise, Update, and Change models. We will not update the website or inform subscribers of such changes due to model modifications. Past performance is not a guarantee of future results and there is always a possibility of significant or complete losses in the equity markets. Future volatility can be much more and returns much less than historical results. Material provided here is only for general informational and illustrative purposes, and is believed to be accurate but not guaranteed. Only you can determine its suitability to your financial objectives and risk profile. Graycell Advisors, and its affiliates, officers, employees, families, and all other related parties, collectively referred to as ‘Graycell’ and/or ‘we,’ is a publisher of financial information, such as the Prudent Biotech newsletter. Historical performance figures provided are hypothetical, unaudited and prepared by us, based on our proprietary analysis and system performance, back-tested over an extended period of time. The performance results obtained are intended for illustrative purposes only. Past performance is not indicative of future results, which may vary. All stock and related investments have a degree of risk, which can result in significant or total loss. In addition, biotech sector is characterized by much higher risk and volatility than the general stock market. Information contained herein does not constitute a personal recommendation or takes into account the particular investment objectives, financial situations, or needs of individual investors. If you decide to invest in any of the stocks of the companies mentioned in the newsletters, samples, alerts, etc., sent to you or available on our websites, you can and may lose some or all of your investment. You alone are responsible for your own investment decisions. We are not liable nor do we assume any responsibility for losses incurred as a result of any information provided or not provided or not made available in a timely manner, herein or on our website or using any other medium. We also cannot guarantee the accuracy and completeness of any information furnished by us. Graycell is not a registered investment advisor and nothing contained in any materials should be construed as a recommendation to buy or sell securities. We may or may not already have existing positions in the stocks mentioned in our reports. Our models are proprietary and/or licensed, and can be changed or revised based on our discretion at any time without any notification. Subscribers and investors should always conduct their own due diligence with any potential investment, and consider obtaining professional advice before making an investment decision.